In the English language, kasha is a term for the pseudocereal buckwheat. In Central and Eastern Europe, especially in Russia, Ukraine, Belarus and Poland, kasha is a dish made of any kind of grains boiled in water or milk, possibly with additives. The largest gross consumption per capita is in Russia, with 15 kg per year. 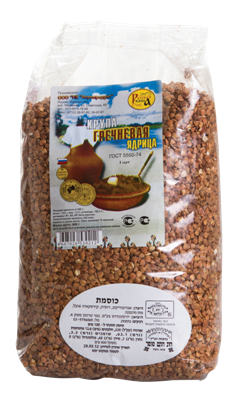 In Russian, buckwheat is referred to formally as Grechikha and buckwheat grain and buckwheat groats as Grechnevaya krupa. Informally buckwheat grain and buckwheat groats are called Grechka, and the porridge made from buckwheat groats is known as Grechnevaya kasha.